This month, we're collaborating with Expedia and their Viewfinder site, with a specific challenge in mind — "show us what Oktoberfest means to Chicago." And stop number two is the Chicago Brauhaus in the Lincoln Square neighborhood on the city's far north side. After World War II, the Lincoln Square area become economically dense enough to define itself as a distinct neighborhood, visually distinct from the larger Ravenswood area surrounding it. It became populated by English, German, and Swiss truck drivers at the time, who drove their agricultural products down Lincoln Avenue to downtown Chicago. A pickle factory, greenhouses, and a booming celery crop helped put it on the map. These days, the main square is defined by small businesses and a large pedestrian area that retain a small town vibe, and many of the bars and restaurants still cater to a German or eastern european palate. In the heart of the square is where the Mayfest and German Fest are held each year — but anchoring it all is The Chicago Brauhaus, one of our most iconic Oktoberfest sites. Within a block of the front doors, surrounded by a quiet, sleepy stretch of street, you can barely begin to hear the sounds of accordion, piano, and chanting inside. A few polka band members stand out front, rocking back and forth on their clogs, smoking a well-earned cigarette. Even in the midst of these few quiet moments stolen each night, they're kind enough to grab the door for you, and say "welcome" with that German heft of an accent that translates to "velcum." Ten minutes later your head is halfway down a stein of Spaten Oktoberfest, and buried in a plate of complimentary head cheese. Waitresses buzz the tables, and band members trade on and off for the spotlight, playing Edelwiess with the bells, firing up the Ricola horn, and leading the crowd with chants of "Ziggy Zaggyy Ziggy Zaggy Oy Oy Oy." There's no time to adjust to your surroundings, rather, then envelop you. On more than one Oktoberfest occasion, I've witnessed a few older men confidently walking the room in full regalia, taking the hand of the first pretty girl they see, and kindly escorting them to the dance floor to join in a traditional dance. There is rarely protest, only surprise. This is the power of the lederhosen. But the real charm of the Brauhaus is the tireless band, led by a local legend known as Gody. Described as the "Austrian Elvis," he puts together a set each night ranging from traditional German ballads, party tunes like Roll out the Barrel, and his own blend of electronica-accordion music that dizzies the room. His time at Bruahaus spans multiple generations of patronage. By the end of our night, he was leading a yodeling content with the young and old. We were shocked at the competency of his randomly selected crew, which made us question our own sobriety. Cue parade. 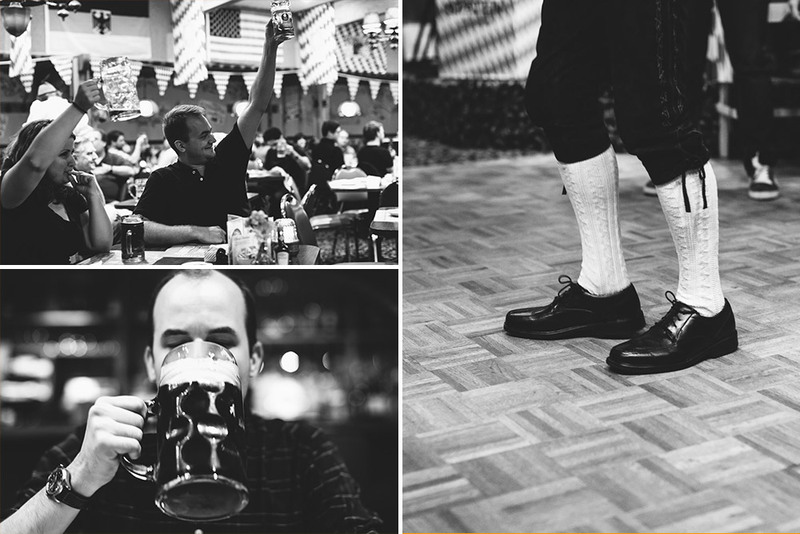 GBH brings you this collaborative series exploring Chicago's Oktoberfest culture, past and present, with Expedia. Follow along here, and on Expedia's Viewfinder site, and watch for the hashtag #findyourbrew. Critical Drinking with Gabriel Magliaro of Half Acre Beer Co.